WELCOME TO THE LODGEPOLE PINE HOUSE, A BEAUTIFUL FOUR SEASON RETREAT FOR OUTDOOR ADVENTURERS, NATURE LOVERS, AND DESIGN ENTHUSIASTS. This brand new ecologically-designed home in the Serene Lakes community backs up to a nature reserve open to cross country skiing, hiking and biking and is a five minute walk from beautiful Lake Serena and Lake Dulzura. The home incorporates natural building materials and incredible detailing in a rustic and modern style. The owner/ architect designed the house to embrace the outdoors with generous porches adjoining most rooms and with windows framing the surrounding pine forest. Bird watch and stargaze from the house. WINTER RECREATION: Downhill skiing, snowboarding, cross country skiing, iceskating, snowshoeing, sledding. Cross country ski directly to Royal Gorge, the largest Nordic ski resort in the country. Less than a 10 minute drive to excellent downhill Sugar Bowl, Boreal Ridge, Soda Springs, Donner Ski Ranch. NorthStar, Squaw Valley, Alpine Meadows, Tahoe Donner are nearby. SPRING: Still some snow pack for skiing and snowshoeing. Perfect weather for road biking before the heat of summer. Find quiet solitude in the low tourist season. SUMMER: Road and Mountain Biking, swimming, hiking, kayaking and sailing, catch and release fishing at Serene Lakes. Great show of wildflowers. Wine festivals, Tahoe Music Festival, Lake Tahoe Shakespeare Festival, Outdoor film showings at Squaw Valley and Truckee. The Owner’s Association beach at Serene Lakes is great for kid’s and adults. FALL: Wonderful fall color. Biking, hiking, boating. Find quiet solitude in the low tourist season. Nevada County Fair. Tahoe Sierra Centruy Bike Ride. Lake Tahoe Marathon. Truckee Renaissance Faire. Golf Classic at Truckee. LOCAL HISTORY: Explore nearby Donner Lake (where the famous Donner Party was stranded for the winter of 1846) and Lake Tahoe areas. Visit historic truckee for shopping, good eats, and winter sport rentals. I am a practicing architect in Berkeley California with over thirty years of experience in the design and construction fields. I love outdoor adventure and photography. 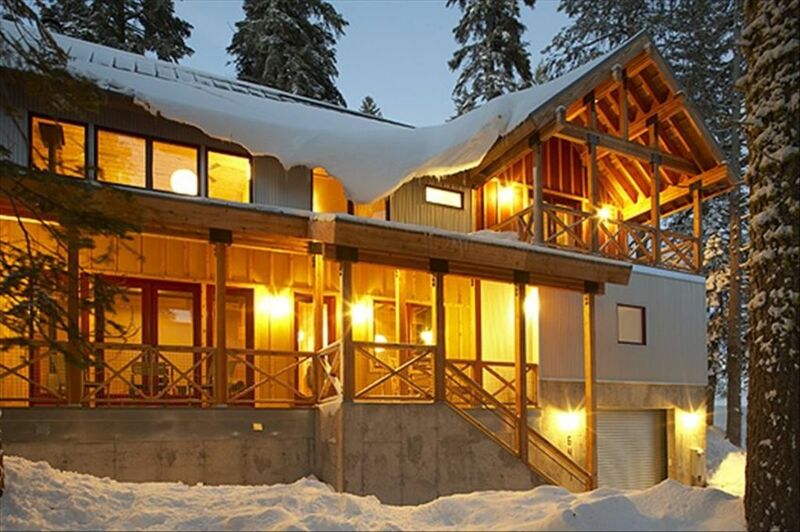 Lodgepole Pine House is a very special custom built home- not the typical vacation rental. commercial gas stove. We love to cook and it shows! recreational equipment available for guests: bikes, kayaks, snowshoes. We had a lovely stay at Lodgepole Pine House! The house was spacious and had nice views of the beautiful snow outside. The kitchen was well equipped and we had everything we needed. Anne was lovely to work with and responded promptly to any questions I had. We hope to make another trip back! The house is infected with worms, bugs and insects. This place is not safe to stay. We couldn't use the bedrooms and had to sleep in the floor due to bed bugs. The owner asked us to clean the house. After our stay, we were accused with not cleaning..etc and our security deposit is put on-hold. The owner hung-up on call when I tried to explain the difficulties we had in the house with kids. Please stay away from this property. This house is infected with insects, bugs and spiders and on top of that the owner will accuse/lie and find ways to not return your security deposit. In 10 years of renting my lovely home I have only had one bad set of renters. These visitors damaged my property far in excess of the security deposit and then bullied and threatened me when I suggested they should pay for the damage. Please refer to all of the 5 star reviews posted about my property by very happy guests. One of the nicest properties I’ve rented and I’ve been renting for decades. This home is beautifully and thoughtfully designed with excellent light and floorplan. The kitchen was as well stocked as my own and I am a devoted home chef. Being able to use bikes and kayaks was such a bonus so we could truly take advantage of Serene Lakes. Looking forward to a winter getaway here some day soon. So glad you enjoyed the house! Thanks for taking the time to review. This house was impeccable in absolutely every way! So many places to relax and sleep. We enjoyed a private chef coming in to prepare a brunch, the kitchen fully stocked with every kind of dish/towel/napkin/silverware/etc. we needed. The bedrooms were absolutely comfortable and delightful. The design of the home added to an exquisite Tahoe ambiance. We absolutely loved our stay! Clean, comfortable, everything we needed. Beautiful modern mountain home with plenty of space to spread out. Can’t wait to go back. Full library including fiction, local history and nature guidebooks.